What do Hillary Clinton, Missy Elliott, Wendy Williams, and Oprah Winfrey all have in common? Thyroid disease. Today I'm going to discuss thyroid disease symptoms and signs. On March 4th, 2019 Wendy Williams returned to her show after a two-month leave of absence. The queen of hot topics became a hot topic herself. Now the rumors around said that her husband allegedly has a mistress and that this mistress has just allegedly had his baby. When Wendy returned to the show I sat there just waiting to see if she would spill her own tea, but Wendy said that her leave of absence of was due to complications of thyroid disease and a shoulder injury. Several episodes later, Wendy revealed that she has a history of a cocaine addiction, which she shared with us in the past and that she has been living in a sober house. Today I'm going to talk about the symptoms of thyroid disease. I'll discuss the different types of thyroid disease, and I'll compare the symptoms of Graves' disease to the symptoms of cocaine intoxication. Then I will weigh in on if I still believe that Wendy Williams really has Graves' disease. The thyroid is the organ, the gland that's located right in the front of the neck. It's located interior to or in front of the windpipe, the trachea, and it's right above the collarbone, or your clavicles. The thyroid is responsible for regulating your metabolism. It controls how one uses and stores energy. When a person has thyroid disease, they can either have an overactive thyroid like in Graves' disease, what Wendy Williams says that she has, or they can have an underactive thyroid or hypothyroidism. Often times, thyroid disease is caused by an autoimmune disorder. An autoimmune disorder occurs when the body's antibodies, instead of attacking the bacteria, and viruses, and germs of the outside world, those antibodies turn on you and attack your own system. In many cases of thyroid disease, the body's immune system is attacking the thyroid and making it either overactive or underactive. Let's talk about hypothyroidism or underactive thyroid. Hypothyroidism occurs when the thyroid is underactive or when you have insufficient thyroid hormone being produced. It can occur in the case of an autoimmune disorder like in Hashimoto's thyroiditis. It can also occur if a person has had the thyroid removed, a thyroidectomy such as in the case of thyroid cancer. Other symptoms associated with hypothyroidism include slow speech, slow movement, and slow heart rate. It can also be associated with swollen ankles and in severe cases, a myxedema coma. In addition to hypothyroidism being associated with abnormal menstrual cycles, it can cause other issues specifically in women. Hypothyroidism has been linked to miscarriages. In cases where the pregnant mother has hypothyroidism, it can cause congenital abnormalities in the newborn baby associated with intellectual disabilities. You diagnosis hypothyroidism by a simple blood test in addition to having a history and physical by your physician. In the blood test, you check for TSH or thyroid stimulating hormone as well as free thyroxine or T4. Once it is diagnosed, especially with primary hypothyroidism, you're able to be treated by thyroid supplementation, levothyroxine. Some limited studies suggest that selenium supplementation helps with hypothyroidism as well. Hyperthyroidism occurs when you have an overactive thyroid such as in Graves' disease. 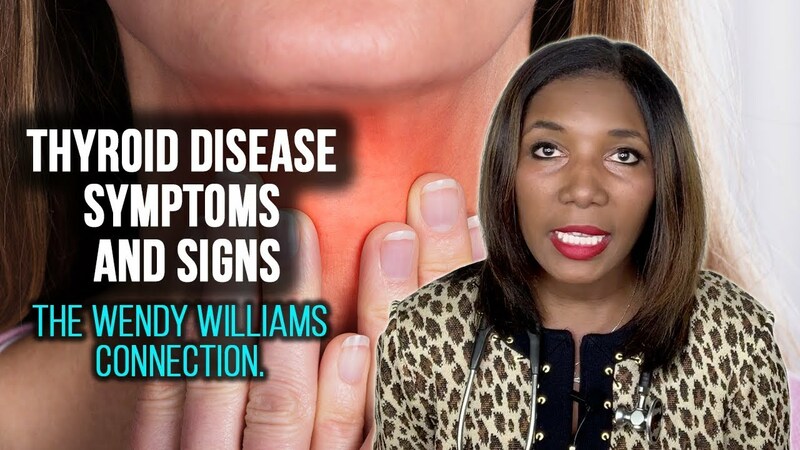 Graves' disease is the illness that Wendy Williams says that she has. Now I actually talked about Graves' disease in a previous YouTube video so please see that video for more details. But I do want to address Wendy Williams. How when she came back from her two-month leave of absence, she did say that she was gone due to complications from her Graves' disease and her shoulder injury. She said that she was ill, but then in the same breath on that same initial episode, she also said that she's been working out two hours a day. A lot of people questioned that. If you're extremely ill, how do you have the energy to work out two hours a day? Afterward, several episodes later when she came back and said that she had a history of cocaine addiction and that she has been living in a sober house with a 24-hour sober coach, then a lot of people just really started to question that. That's when all of my patients, my friends, my family members, my subscribers started asking me questions, "What do you think is going on with Wendy? Does she really have Graves' disease?" I will say this. A lot of the symptoms of hyperthyroidism or Graves' disease overlap with the symptoms of cocaine intoxication. Let's discuss. Here are some symptoms of cocaine intoxication or long-term cocaine use. Increase in heart rate. Increase in blood pressure. Tremors. Unintentional weight loss. Here are some symptoms of hyperthyroidism or Graves' disease. Increased heart rate. Increased blood pressure. Tremors. Unintentional weight loss, so you do have an overlap. Here are some other symptoms of cocaine intoxication or cocaine abuse. You can get coronary artery vasoconstriction meaning that your heart arteries tighten, and that puts you at a risk for a heart attack. You can also get aortic dissection when the largest artery in your body just dissects, and you bleed out, and you typically don't do well. There can be neurological complications with cocaine use such as seizures, a coma, stroke. For people who inhale cocaine through the nose intranasally, you can get a perforated nasal septum meaning that cartilage that separates your nostrils can literally get a hole worn into it from the chronic use of the cocaine going in the nose. For people who smoke crack, crack has to be heated up. It has to be hot. You can get pharyngeal burns, or burns of the throat, or even heat damage to your lungs. Also, pulmonary infarction can occur with smoking crack. These are the symptoms of cocaine intoxication. Additional symptoms of hyperthyroidism or Graves' disease include heat intolerance where even if everyone is feeling cool, you might be hot. You can also get hyperdefecation or abnormally frequent bowel movements. In women who have Graves' disease, they can have abnormal menstrual cycles. 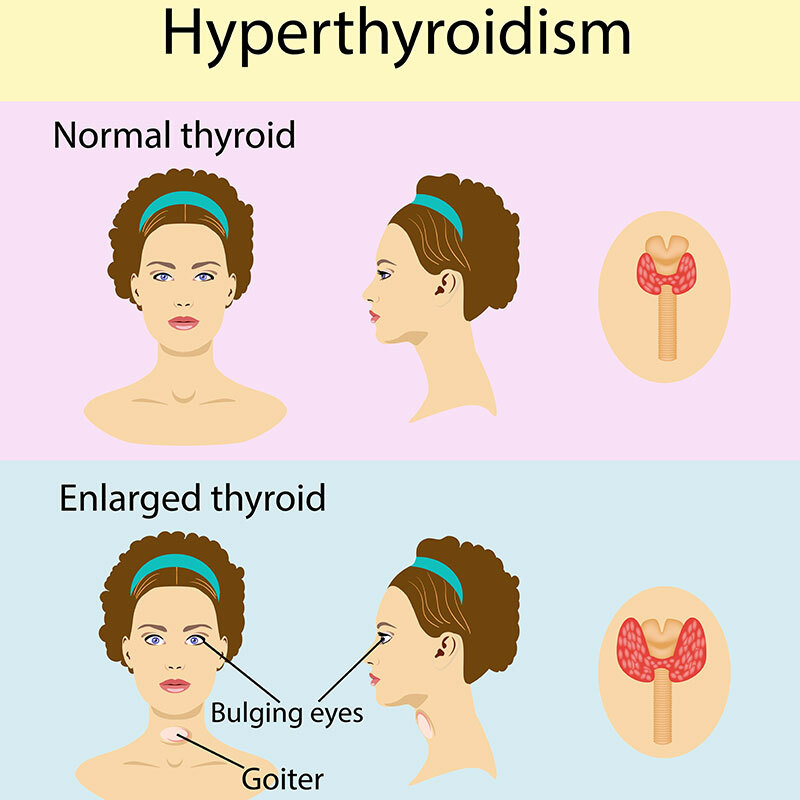 Here are two symptoms that you can also get with hyperthyroidism. That is interesting because these are symptoms, which Wendy has shared that she's had for years. You can get hair thinning. Now you know one of Wendy's big things is that she wears wigs, and sometimes she'll put little notes on her wigs. She makes a big, little shtick of it, but she has shared that she has thinning hair related to thyroid disease, and that's been years ago when she shared that. Another symptom that you can get with Graves' disease is exophthalmos or when the eyes look very large, or like they're bulging out, or like you can see all of the whites around the irises. The exophthalmos occurs in hyperthyroidism when there's a swelling of the eye muscles that actually push the eyeballs out, to make them protrude. Wendy Williams has had that. She shared it. Plus, if you've watched her show over the years, you can see sometimes when her exophthalmos is acting up. These are a couple of symptoms that I think that most people can agree that Wendy Williams has demonstrated, so the question, cocaine intoxication versus hyperthyroidism? For everyone who's been asking me if I still believe Wendy that she has Graves' disease, my answer is now yes. It's still yes. I absolutely believe that she has Graves' disease because I have been watching Wendy Williams for a long time. I've actually followed her for a long time. I remember back in the day probably like 15 years ago when Wendy Williams was trying to interview Daryl Hannah. When Daryl Hannah was talking to Wendy Williams she commented. She said, "Nice eyes, Wendy." At that time, Wendy did look like she had protruding eyes. She looked like she was having exophthalmos. When Daryl Hannah walked away, Wendy Williams looked at the camera and said something to the effect of, "Hey, I have thyroid disease," like she's picking on people with thyroid disease, something like that. This thyroid story is not something new that Wendy Williams is making up. I honest to goodness believe that she has Graves' disease. I'm not her doctor, I don't know for sure, but in answer to the question that people have been asking me, I do believe her. Does she also have cocaine issues? She shared that, she told us that she does. My heart goes out to her, and I fully support her. I pray that she gets better. I'm happy that she's seeking help in the sober house, and I'm happy that she's founded the Hunter House where she can actually reach back and help others who are dealing with addiction. As for the alleged rumors with her husband, and this alleged mistress, and baby, I, of course, don't know if any of that is true. I hope it's not true, but if it is, I certainly pray that Wendy Williams makes the right decision for herself and for her family. Bottom line, I'm still rooting for Wendy Williams. We have now discussed hypothyroidism and hyperthyroidism. Let me just briefly touch on a few other diseases of the thyroid. Goiter. What is a goiter? Probably most people have heard of it, but you may not be sure of what it is. A goiter is an enlargement of the thyroid gland. It can either be an evenly enlarged gland, or you can have a diffuse goiter, or it can be a bumpy enlargement, or a nodular goiter. Goiters can be caused by Hashimoto's thyroiditis or hypothyroidism. Goiters can also be caused by Graves' disease or hyperthyroidism. How Do You Treat A Goiter? It depends on the underlying cause. Definitely, you consult your physician. Once the underlying cause of your thyroid disease is treated, perhaps the goiter will get better. In some cases, it may even require a thyroidectomy or partial thyroidectomy where the thyroid gland actually has to be surgically removed. How do you know if you have a goiter? You may be able to outright look in the mirror and see that your thyroid gland is enlarged, that area right in the front of your neck may be enlarged. If you have a large goiter, you may have symptoms such as dysphasia, or difficulty swallowing given that the thyroid is sitting right there in front of your esophagus, that type between your mouth and your stomach. Other symptoms include dyspnea or shortness of breath, which makes sense also given that the thyroid is also in front of your windpipe or your trachea. If you have a large goiter, you may experience obstructive sleep apnea where your airway is being blocked especially when you're lying down at night. Another thyroid issue, thyroid nodules. A thyroid nodule is a round growth within the thyroid. Now it can be totally benign and harmless, but it does need to be evaluated because it could be cancerous or have some other type of pathology. You must consult your physician or your endocrinologist to have your thyroid nodules examined. Your physician will examine your neck and palpate the nodule to see if it feels like it's smooth, or it feels like it's irregular. They will usually order some type of imaging, like a thyroid ultrasound to help them to see what that nodule look like and if it's suspicious for something that's malignant. Often times, your endocrinologist may decide to do an FNA or fine needle aspiration. In that procedure, they actually aspirate or remove the contents of the nodule by needle and are able to see if the nodule is benign, or if there's some cancerous tissue within it. If you are having hyperthyroidism, overactive thyroid, and you have nodules, then your physician may also order a thyroid scan to help to assess whether or not your thyroid nodule is producing excess thyroid hormone. This ends my overview of thyroid disease. We've talked about hyperthyroidism. We've talked about hypothyroidism. We've discussed how the symptoms of cocaine intoxication overlap with symptoms of hyperthyroidism. We've also talked about certain symptoms of thyroid disease that are specific to women such as abnormal menstrual cycles. Even though thyroid disease tends to be more common in women, remember men, you can also get thyroid disease, so make sure you are following up with your physician. I want you to comment down below. I want you to tell me what you think about Wendy Williams and what's going on with her. Do you believe that she has Graves' disease? Also, if you've had any kind of experience with thyroid disease yourself or with a loved one, please share in the comments below. How do you deal with your thyroid disease? As always, I want you to do your best to live your healthiest, happiest life.